In January 1941, British Empire forces began a two-pronged invasion of Italian East Africa, the fascist-ruled colonies on the Horn of Africa. Britain had known only defeat up until this moment, but after a grueling 11-month campaign the Empire had its first victory. Africa Orientale Italiana is a complete Panzer Grenadier game based on these battles: the Italian conquest of Somaliland and British re-conquest, the campaign in Eritrea including the bloody Battle of Keren, the South Africa invasion of Somaliland and much more. There are 40 scenarios based on these battles, organized into “battle games” that allow you to play the scenarios in sequence toward your army’s operational goals. 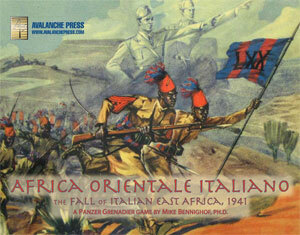 Africa Orientale Italiana includes 583 playing pieces, most of which originally appeared in our old out-of-print Desert Rats game and South Africa’s War supplement. 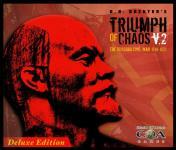 There are eight heavy cardstock maps, the same as those which appear in Conquest of Ethiopia.